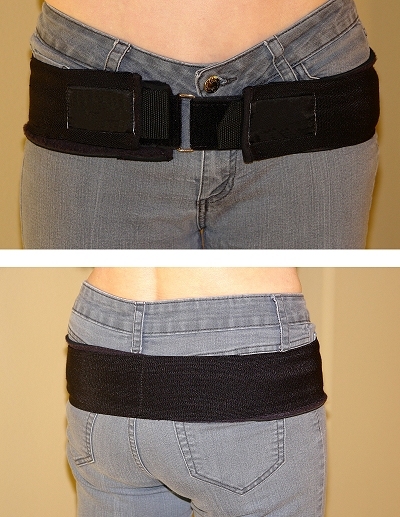 A supportive brace designed for people who suffer from lower back pain. A trochanter belt is a supportive hip brace that can help manage back pain, reduce inflammation in the lumbar area, and restore function. This simple yet effective device is designed to stabilize the pelvis and prevent excessive movement of the sacroiliac (SI) joint. Created to help you manage low back pain and get more out of life's daily activities, this nylon trochanter belt is worn around the hips so that it helps keep the lower back vertebrae in alignment. You should wear it while you golf, exercise, or when doing yardwork, housework or any movement or sport that requires involvement of the lower back muscles. To wear it, simply slip the belt through the chrome buckle until it fits snugly around the hips, then pull each secondary side strap into place. To remove the belt, pull on the side straps until the Velcro lets go, then unloop the buckle. It is lightweight and lays flat against the body. It won't move or creep up while worn. It is virtually unseen when worn under clothes. Comes in Medium, Large and Extra Large. If ordering online, please specify the size you want in the Notes section of your order. Dr. Thomas Santhosh of the Cleveland Clinic Foundation wrote a great article about the many benefits of using a trochanter belt. To read the article, CLICK HERE. Be sure to use your back space key afterwards in order to come back to Geri-Fit's website.